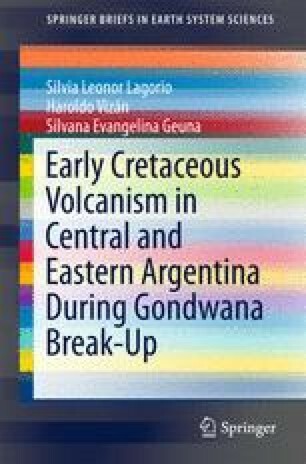 Different processes could have triggered magmatism during the Early Cretaceous in central and north-eastern Argentina. Distinct thermal processes could have possibly acted together in Paraná Magmatic Province (PMP): (1) the track of upwelling (strong upward heat flow) of a wide circuit of convection induced by a subduction in the western margin that cause the rifting of Western Gondwana and (2) a large amount of heat energy insulated by Pangea causing swelling and fragmentation of weak lithospheric zones, with high percentages of melting typical of the tholeiitic magmas. This volcanism must have emerged through lithospheric fracturing mainly in suture areas between old cratons, while South America plate was beginning to be dragged westward by a large convective roll. By contrast, the low volume of alkaline volcanic rocks in Sierra Chica of Córdoba (SCC) is in agreement with low melting degrees, in a geodynamic framework supporting edge-driven convection: (1) the presence of a large thickness contrast between the Río de La Plata craton and the Pampia terrain, (2) an environment of pull-apart basins and (3) a low rate of latitudinal and longitudinal velocity of South America.